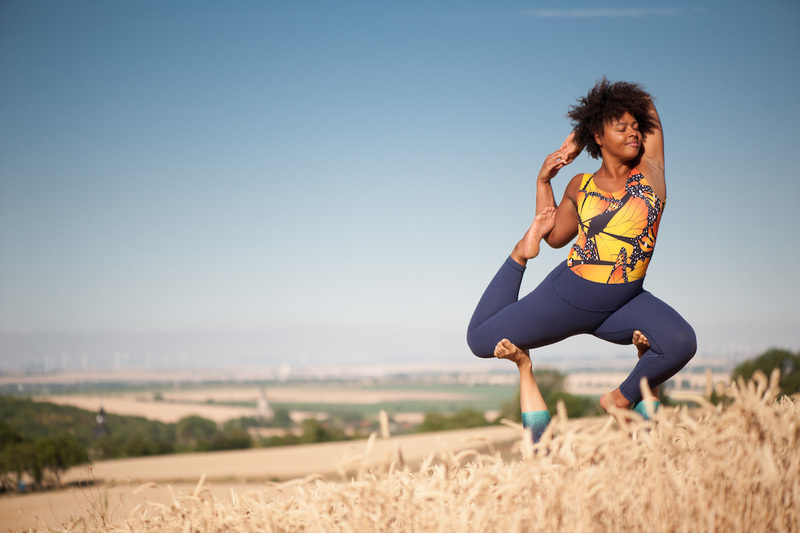 AcroYoga International Foundation Course with Lisa Looping & Afia Joy Adu-Sanyah in Vienna! Ready to really take off? The AcroYoga Int’l Foundation Course will teach you everything you need to know to build a safe and sustainable practice. Our team of experienced international teachers will give you all the tools you need to start or evolve your practice. You will unlock new physical and emotional skills you never thought possible, make new friends and connect with the global community. Lisa Looping is AcroYoga International Immersion teacher based in Vienna and crazy happy to teach this Foundations Course together with her amazing monkey sister Afia Joy from Frankfurt! 40 days prior full refund minus 50€ processing fee. Within 40 days to one week before= 50 % refund. A week before or during event, no refund, no exceptions. A very special weekend is awaiting you in Vienna with Pascal and Julia Weis visiting from Germany bringing 6 workshops that they are most passionate about. The high skill level of these 2 amazing AcroYoga International Lead & Immersion teacher is outstanding and combined with an open heart & mind! 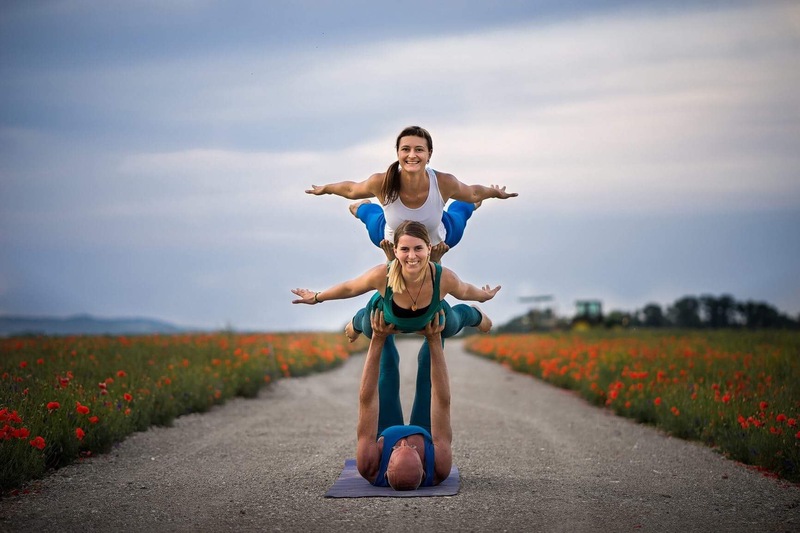 They are not only a teaching couple but also living the AcroYoga principles in their daily family life with 2 kids – absolutely inspiring! If you already participate last November this time it will be all new content! -> Discounts for multiple bookings available! Get ready to dive down deep within the healing Lunar practices. Come join us on the journey of true listening, diving deep into the art of touch down on the ground and up in the air. The Lunar Immersion focuses on the healing, relaxing and rejuvenating practices of healing arts, Thai Yoga Massage and therapeutic flying. In preparation for the dance of Thai Yoga Massage the Lunar Asana Sequence teaches basic body mechanics with a focus on cultivation of self-­love. The techniques learned on the floor are then translated to the flying work, using the element of gravity to amplify the healing flow of prana (life force). Often, we will work in teams of three for safety and support, and everyone will have the opportunity to base and fly, heal and be healed. This event fulfils a pre-requisite for AcroYoga teacher training. The immersion will be taught in English. Yogafusion Studio, Tendlergasse 11, 1090 Vienna (entrance at the corner). SPECIAL PRICE for Eastern European countries! Please contact us for more details. This immersion is non-residential. All fees are excluding accommodation and food. Your registration is complete and your slot is secured when investment is settled. – Up to 45 days prior to event start: Full refund less an administrative fee of € 50. – 14 days prior to event start: 50% refund. – After that: No refunds, no exceptions. – No refunds or discounts for failure to attend or failure to complete the workshop. 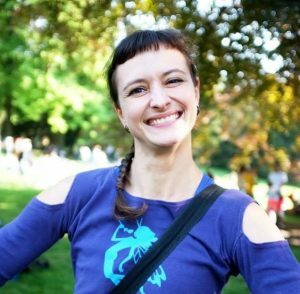 ​Julia is a well known yoga teacher and shares her passion since 2009 as a traveling AcroYoga teacher. It is the the group dynamics, the communication tools and techniques of this modern style of yoga, that caught her attention ever since the first time upside down back in 2007. It was more than 16 years ago that Julia plunged into the practices of yoga. From that moment on there was no looking back and the magic started. After her first yoga teacher training (2004), her passion for yoga grew even more and she started sharing. While studying Literature and Biology at the University of Karlsruhe, she explored and studied Ayurvedic massage in 2005. 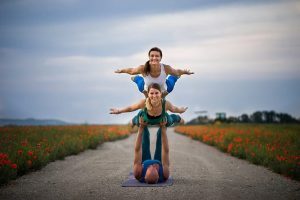 It was three years later when she found the individual lines of traditional massage, yoga and acrobatic training combined and aligned in AcroYoga. 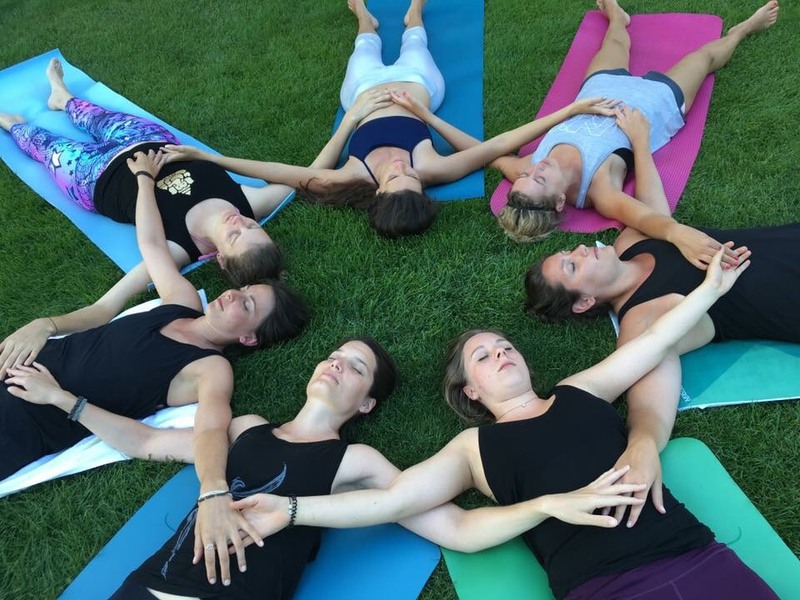 The community aspect, the group dynamics and communication techniques that enrich and inspire this modern yoga practice took her style to a whole new level. 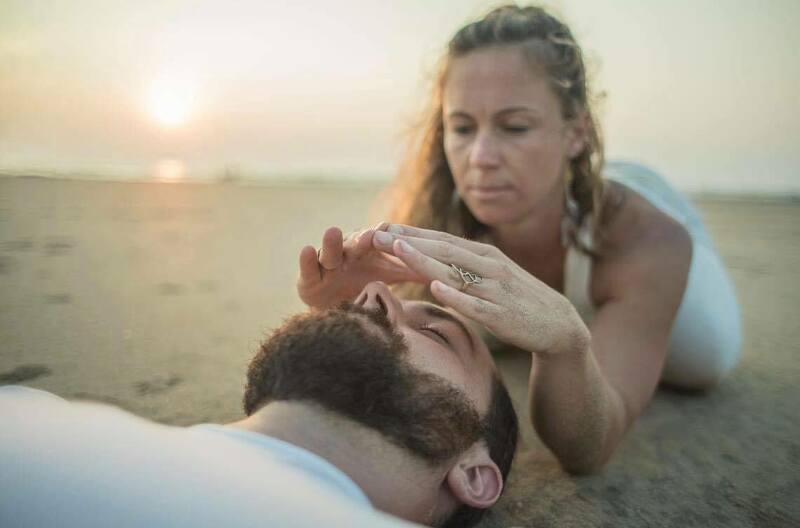 Since the Acro Yoga teacher training in 2008 and continued Thai massage intensive studies from 2009 to 2011 she passes on the abundance in the form of yoga classes, workshops and trainings. Today Julia enjoys being a mum, travels the world and guides people to see the beauty of their full potential. Do more of what makes you truly happy! ​Lisa has made two of here biggest passions her profession: Yoga and Hula Hooping. When teaching and performing worldwide she wants to inspire more people to try the same, as it is her ultimate goal to contribute to other people’s happiness and lead a meaningful life while enjoying the process. Aerial Yoga is her other passion that combines two of her biggest motivations: Playfulness and flying without wings. 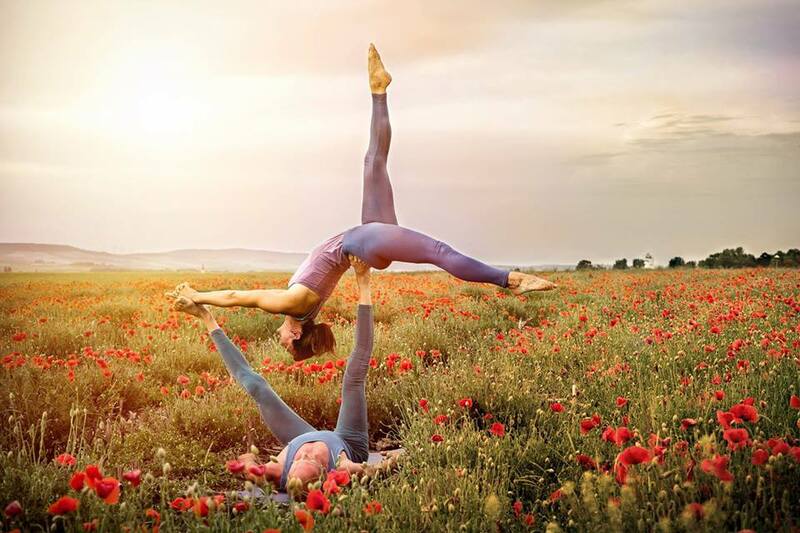 Together with Aerial Yoga Vienna she is passionately leading Aerial Yoga Teacher Trainings worldwide and co-organising the annual Aerial Arts Festival Austria.